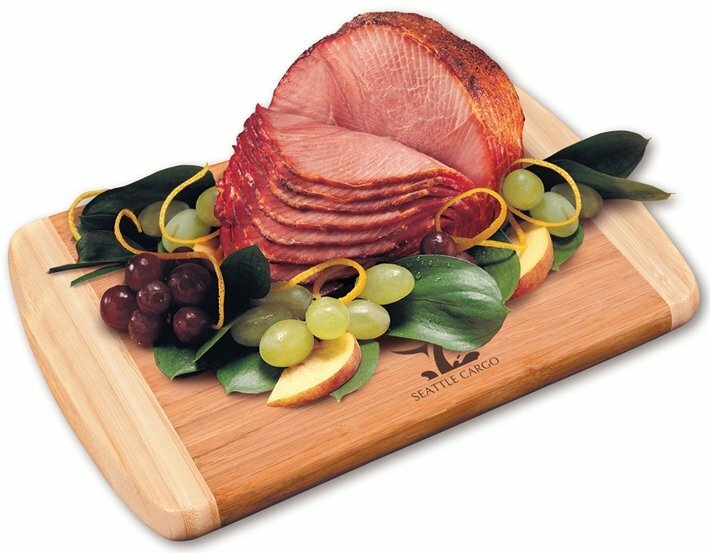 Full satisfaction holiday food gift in Maple Ridge Farms™ Boneless Ham. Applications are employee appreciation, best customers holiday gifts. Honey Cured Ham, fully cooked and a 12 x 8 x 3/4 cutting board. Your logo permanently remembered firebranded into the wood. Special cold pack packaging used for shipping to retain flavor. Why wait till the last minute for your holiday corporate gifts? Advance orders accepted for up to Dec. 20-22 delivery. Actual order must be placed no later than Dec. 6th. Optional individual gift shipments add $4.00 each. Individual gift shipment order placed by Nov 29. Normal delivery from date of order is 3 weeks. The food in this gift is Made in the USA. Price includes a fire branding in an area 3 1/2" w x 1 1/2" h.
Factory setup charge is $50.00. Repeat setup no charge. Second location firebrand cutting board 3 1/2 x 1 1/2. NO SETUP and add $4.00 per unit running charge. One color art only for logo design on this product.